Sunday's workshop was less contemplative (see post below), more free form. Less quiet, more machine buzz. Anni Hunt gave us plenty of inspiration to get us started - showing her amazing work stretched on canvass frames. Anni is a City and Guilds graduate Fibre Artist, a generous teacher and generally (like most quilters I know) a pleasure to be around! 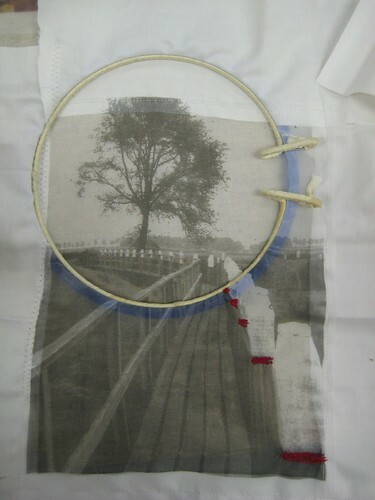 This workshop, called "Stitched Images" began with technology: transferring an image to fabric via a colour inkjet printer. Easier said than done! The receiving fabric included organza, canvass, cotton duck, muslin, and possibly others. From here the instructions were thus: go crazy! stitch! stencil! Shiva paint! burn! puff-paint! I brought two of my photos, one scenery, one a bark study I showed you here. I like to photograph pathways. 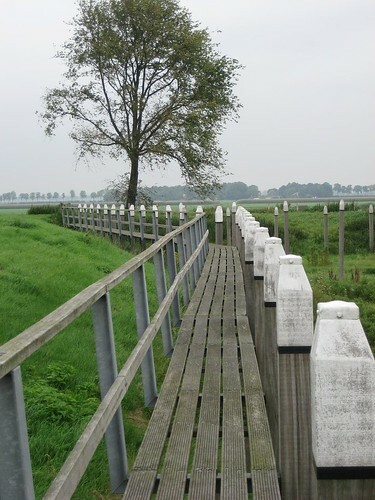 This one is from a very cool place in the Netherlands called Schokland - a medieval village that once sat isolated on a teeny island, but now is surrounded by reclaimed farmland. In photoshop, I converted it to gray scale and ramped up the contrast a bit. 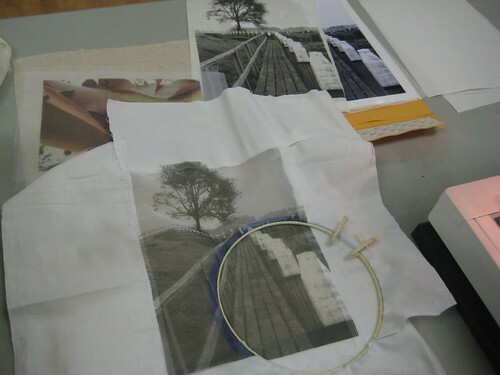 Then with Anni's help, I printed the image onto organza and cotton. The plan was to layer the organza image on top of the cotton one for some depth. Sewing leaders around the organza allowed me to hoop it so I could do some stitching on my machine. Then, after removing the leaders, layered it over the cotton image and put those two on a piece of cotton duck. Then, more stitching to attach the three layers together. 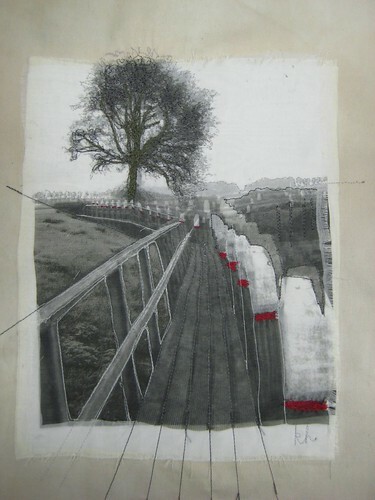 After stitching, I cut away some of the organza to show the detailed texture of the photo underneath (between the railings of the pathway), extended some lines off the image, and filled in the foliage of the tree. It is now ready to be stretched over a piece of foam core and mounted in a frame. just back from a trip to NS and had to check! Love how this turned out. Looks like a lot of fun, too! I haven't tried printing on fabric, but I will - someday. Can't wait to see the Arbutus bark one. Wow, I’ve never been to Schokland myself. I love how you fused too crafts together in a lovely work of Art!